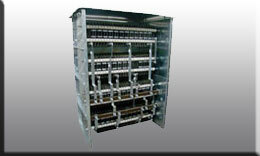 MAGCO RESISTANCE BOXES are System Grid Type Resistance Boxes & are used with slipring (AC and DC) motors. They are used for various applications in converyours, steel rolling mills, Rubber Mixing Mills, Halligues, compressors, Crane, etc. Resistance Boxes are manufactured to suit customers specific requirements. The Resistance boxes are operated through DRUM Controllers. Master Controller, contractors.